Facebook has today announced a handful of changes to the way it displays videos in its mobile apps today, with one change in particular likely to upset some people. Following a period of testing that was first discovered in August and has been running on and off since then, Facebook will now begin to automatically play a video’s sound as it is displayed on-screen. Up until now, videos were muted until they were interacted with. Following the change, that will no longer be the case. The good news here is that using a device’s mute switch orientation and Facebook settings, the audio can be disabled within the app if a user so desires. By default though, it’s all audio, and all the time. Actually, that’s not strictly accurate – Facebook has confirmed that the audio will not take over from apps such as Apple Music and Spotify, so your tunes won’t be interrupted if you have the misfortune to flick past a video on your feed when listening to your favorite Taylor Swift track. Videos in News Feed have previously played silently — you tap on a video to hear sound. As people watch more video on phones, they’ve come to expect sound when the volume on their device is turned on. After testing sound on in News Feed and hearing positive feedback, we’re slowly bringing it to more people. With this update, sound fades in and out as you scroll through videos in News Feed, bringing those videos to life. 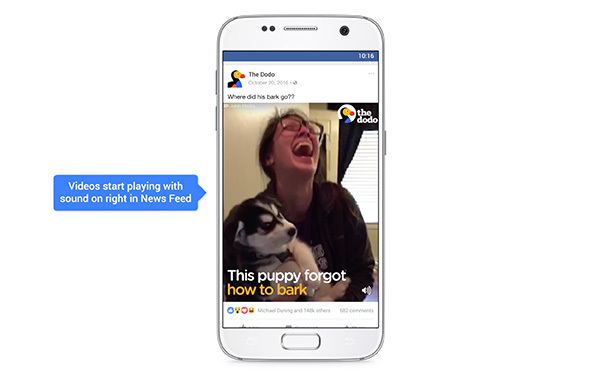 The theory behind the move is an obvious one, with Facebook hoping that the addition of sound to videos by default will increase and lengthen the levels of engagement in its apps. For users though, there’s the obvious concern that they will be faced with videos playing audio when they do not expect them to, potentially leaving them wide open to embarrassing situations where audio is blaring from their devices in places where it really shouldn’t be. Facebook believes its users are savvy enough to prevent that from happening. I say people forget things like this, but that’s where settings come into play. I suggest you disable it to prevent videos from auto-playing with sound. I know I will be doing the same. Just turn off the video autoplay feature.